On Sunday night, 12 Years a Slave was named best picture at the 86th Academy Awards. And John Ridley, the film's screenwriter, won the Oscar for best adapted screenplay. Ridley's screenplay was based, of course, on Twelve Years a Slave, the 1853 memoir by Solomon Northup. Published not long after Harriet Beecher Stowe wrote her famous novel about slavery, Uncle Tom's Cabin, Northup's book became something of a bestseller, selling around 30,000 copies, before falling into relative obscurity for the next century and a half. The 2013 film obviously put the memoir back into the spotlight, and it inspired someone (we're not sure exactly who) to put the book on the web in a handsome, readable format. 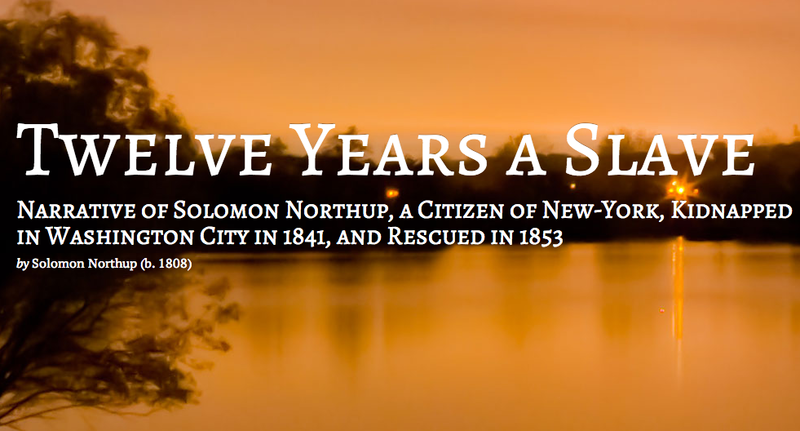 You can head over to 12years.org to read Northup's dramatic personal account, free online. Or find somewhat less attractive (though still serviceable and downloadable) versions at Archive.org. For anyone interested in downloading Twelve Years a Slave as a free audio book, Librivox has you covered here: Free on iTunes - Free MP3 Stream/Download. Also, if you care to sign up for Audible.com's 30-Day Free Trial you can download a version professionally narrated by Louis Gossett Jr. at no cost. Find more details on Audible's Free Trial program here. 635 Free Movies Online: Great Classics, Indies, Noir, Westerns, etc. Kindly send me pdf version of famous book “Twelve years a salve”.